Ask yourself this: What is my passion? Is my passion real? Are my intentions in line with my end goal? If you had asked me those questions, I would have said yes. It started with photography. I was the self proclaimed “cellphone photographer” back in early 2000 when the Motorola Razr was a hot commodity. “Wow! You’re really good at this!” said one friend. That was all I needed to start thinking about improving my skills to become the world’s first famous photographer using a cheap flip phone. Sammy: World Renowned Cellphone Photographer. That sounds good—right? Fast forward a decade, Instagram crushed my dreams. I’m not famous—but alas, good has come out of this. Now anyone can become famous taking pictures with their phone! There’s something wrong here. I was never passionate about cellphone photography. I was passionate (at the time) about becoming famous. The reality is you will come across a lot of things that may seem like your passion, but only one, if not a few, will ring true. Now back to the question—What is your passion? 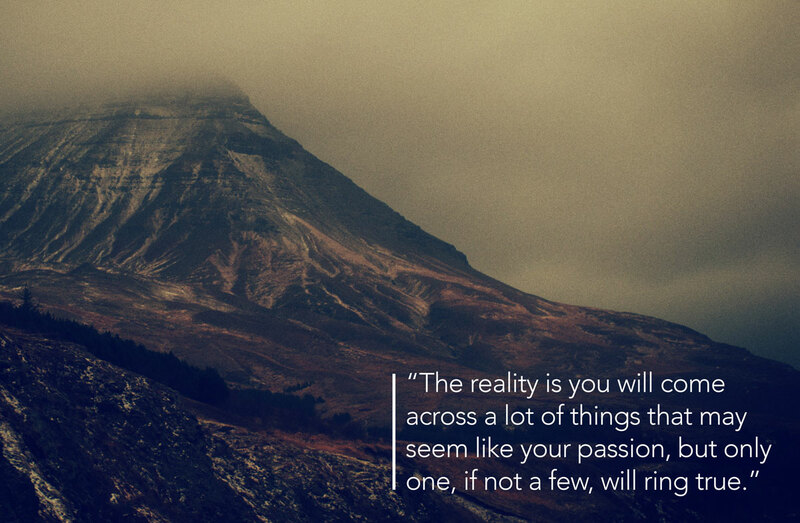 Is your passion real? Are your intentions in line with your end goal? Do you want to become a world-renowned cellphone photographer or do you want to make a real difference in your life and others? Revisit your Childhood. Did you love to draw? Did you love to sing? Maybe you pretended to be a doctor with your siblings. Write a list of what made you happy as a child. You will start to make connections between what you did then vs. what you do now. Do what you love. In doing so, you’ll learn some tasks end up being a hobby, while others become something that you truly enjoy doing and look forward to. You may find something that you enjoy doing so much that you couldn’t imagine life without it. Pray on it. I know not everyone shares the same beliefs, but for me, I had clear guidance from God to pursue my passion. No matter what you believe, it is important to take time to remove all distraction/noise and listen to what is in your heart. You won’t be led in the wrong direction if it is coming from a still and peaceful place. I hope these tips help guide you on your way, as it is only the beginning. If you think you arrived at something, let me know. As mentioned in my first post, I am not a writer, author, or selling you a course. I am like you, someone who felt the urge to one day leave his day job, pursue his passion, and turn it into a profitable business. I did nothing to deserve what I have except strive to do my best and hope it will get noticed. Today I run the New York based Agency, Elfatrany Design with myself and colleague, Jacqueline Boone. This post is the second in my series where I share insights and experiences in an effort to connect with like-minded individuals who share the same passion. I’d love to hear your thoughts, comments and feedback.